Gregory Earl Caplinger, alias Gregory Frazier, died in July 2009 while serving a 12-year prison sentence for fraud. For many years he claimed to be a distinguished and widely published medical doctor and researcher. However, he did not have a bona fide medical degree and made more claims and accumulated more questionable "credentials" than any other impostor I have ever investigated or heard of. He got into legal trouble at least six times for defrauding people. During the mid-1990s, he began operating a clinic in the Dominican Republic that offered treatment to desperate patients. In 2000, after a six-day trial, a North Carolina jury convicted him of wire fraud and money laundering related to "investments" in his phony remedy "ImmuStim." However, he did not show up for the verdict and remained at large for nearly a year before being captured. In 2001, he was sentenced to federal prison and ordered to pay more than $1 million restitution to his victims. Weekley's solicitation stated that the clinic had operated for 12 years, had treated more than 1,200 cancer patients, and was operated by Immuno Pharmaceuticals, Inc., and World Medical Services, S.A., Inc. The treatment, most forms of which are intravenous, was said to be administered daily for two weeks, three times a week for two weeks, twice a week for the second month, and once every other week for the third month. The solicitation summarized data said to be the results of clinical trials, but there was not enough detail to evaluate the reported results. Interleukin 2 and interferon have legitimate use against a few cancers. However, the solicitation stated that the doses Caplinger used were lower than those used for standard cancer care. Caplinger also said: (a) ImmuStim was manufactured in the Dominican Republic; (b) he discovered it and had sole control over its administration and research; and (b) Immuno Pharmaceuticals held a Dominican patent and had applied for a U.S. patent . According to figures compiled by the FBI, approximately 15 people were swindled out of a total of approximately $230,000 they invested in Immuno Pharmaceuticals stock . Another investor who had signed a contract to invest $2.3 million pulled out after concluding that something was wrong. The building was a converted office building with other medical offices on the second and third floors. Caplinger merely rented space on the top three floors. One floor housed his office, one had treatment rooms and a few "hospital rooms," and the third had more "hospital rooms." The total number of private rooms was no more than 20, not all of which appeared to be in use. "Hospital" patients had to supply their own sheets. The building had no hot-water supply. Another IIMS/HC brochure stated that the "cost levels" ranged from $3,000 -$6,000 for "General" care to more than $80,000 for "Level Four" care . Five people who contacted me have described costs ranging from $40,000 to $85,000. The brochure stated that "most therapies are reimbursed by private medical insurance plans" except for HMOs, and ICD-9 or CPT code numbers are provided for submitting insurance claims. Most private insurance policies do not cover nonstandard treatment. Therefore, if insurance companies actually paid for Caplinger's services, I suspect they didn't realize what was involved. After much review and evaluation of your specific case we will be able to consider your admission. . . . Your current condition is unstable to say the least and we will need to move aggressively. . . . Due to our limited admission of foreign patients you need to call this Administration this day. The patient had had a colon cancer surgically removed nine months previously. Although follow-up tests had found no evidence of cancer, she contacted Caplinger because she thought that an unconventional treatment might boost her immune system to reduce the odds of recurrence. She states that Caplinger persuaded her to come by telling her that a small Nabothian cyst, mentioned in an ultrasound report, "could go either way" and therefore she needed immediate treatment. The estimated cost was $80,000 to $90,000, with a $40,000 advance deposit. Frightened by the thought that the cyst could become malignant, she wired the deposit and went for treatment. Nabothian cysts are plugged glands that pose no health threat and have nothing whatsoever to do with cancer. Shortly after arriving at Caplinger's clinic, the patient realized she had been defrauded, demanded a refund, and got back $20,000. Dr. Gregory E. Caplinger is both a scientist and a clinical physician. It has been Dr. Caplinger's goal and experience through the years to combine the pure scientific with practical clinical application. He is a European (British) and U.S. trained physician with his medical residency and further subspecialties of clinical oncology/immunology. He currently continues his post-graduate medical education both in Europe and the United States, where he regularly attends courses at Harvard Medical School, Division of Continuing Education. His board certifications include Internal Medicine/Clinical Oncology. In conjunction with his medical studies, Dr. Caplinger completed a Doctor of Science (D.Sc.) in Biochemistry/Immunology. It is in these disciplines that he continues his research and writing of articles. He has published 26 articles as primary author and written a laboratory manual entitled "Practical and Clinical Immunology for the Classroom. He recently completed a textbook titled "Progressive Immunology" (Released in 1996). Except for the biology degree, all of the above credentials were bogus or questionable. In the late 1990s, an AMA investigation concluded that Caplinger did not have a legitimate medical degree . The current AMA Master File, which contains information about all of the more than 900,000 physicians who have been licensed to practice in the United States, contains no listing for Caplinger . The Sussex College of Technology was operated by "Dr." Bruce Copen, who said that he became a doctor of homeopathy by completing a correspondence course in 1952. In 1990, he gave a Sussex Police Department investigator a letter from Caplinger specifying that: (a) his "doctor of science" degree should be be dated 10/5/87; (b) that his dissertation should be titled "Biochemical and Immunological Approaches to Cancer Therapy"; (c) his "transcript" show that he had completed 58 hours of study with a grade-point average of 4.00 (straight A's); and (d) the degree and paperwork should be sent by express mail. The letter had been accompanied by a $70 check . The "College of Physicians and Surgeons," if one exists, is not a recognized British medical organization. "Board certified" is an American term. Caplinger is not certified by any board recognized by the American Board of Medical Specialties. Papers distributed by one of Caplinger's agents stated Immuno Pharmaceuticals was registered as a corporation in Pennsylvania in 1995 and that in 1996 Caplinger owned 30% of its stock. The "research" produced by Caplinger and/or the company is described in the last section of this article. The initials "FACIP" stand for "Fellow of the American College of International Physicians." ACIP is a respectable voluntary organization that conducts health-related activities intended to benefit the medical profession and the public. It has approximately 1,500 members, most of whom are physicians. Physicians who join ACIP are called "fellows." Caplinger is not listed in ACIP's online (1996) directory, but he did belong in the past. Since voluntary health organizations don't normally check the credentials of their applicants, Caplinger became an "FACIP," even though he could not meet the eligibility requirements. 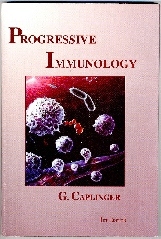 Caplinger's Progressive Immunology  does not resemble any textbook I have ever seen. During a half-hour scan, I spotted about 200 spelling errors. The book's 223 pages included a few introductory pages, 11 chapters, and a 2-page list of references. Four chapters resembled standard texbook chapters with citations (the author's last name and publication date) embedded in the text. However, no references corresponding to these citations were listed anywhere in the book. I suspect that he lifted these chapters from standard textbooks but forgot to include the references. Most other chapters mention no references at all, except where charts or drawings are used. One chapter (about "homeotoxicology") is pure gobbledygook. The final reference list is not numbered and is neither in alphabetical nor chronologic order. The only citation later than 1984 is a report written by Caplinger himself. Considering how rapidly medical science is advancing, do you believe that a textbook whose references are at least 12 years old could be valid? Caplinger probably figured that the people who saw it would not know enough about the subject to see that the book was a fake. In 1984, the Florida Department of Professional Regulation investigated complaints indicating that Caplinger had been practicing medicine without a license. The case was settled without prosecution because Caplinger signed a cease-and-desist agreement, said he had terminal cancer and was moving to France for treatment, and indicated that he had no intention of returning to Florida. The IIMS/HC brochure stated that "for the last 20 years Dr. Caplinger has made his home in the Dominican Republic." However, investigative reports indicate that, in 1986, he operated the "Natural Health and Therapy Clinic" in Boone, North Carolina, while falsely representing that he had valid medical and naturopathic credentials. Later that year, he closed this facility but began seeing patients in the office of a chiropractor in Blowing Rock, North Carolina. During 1987 and 1988, Caplinger operated the Blue Ridge Health Clinic in Blowing Rock while advertising in the 1987 and 1988 Yellow Pages as a "Naturopathic Physician, Registered with the Board of Naturopathic Physicians." A reporter who investigated found that no such state board existed but the telephone directory had a listing for the "NCB of NP" at the same address as Caplinger's office. During this period, Caplinger claimed that he had cured himself of cancer using "natural healing" techniques. Near the end of 1988, after Caplinger had practiced illegally for more than three years, North Carolina authorities charged him with practicing medicine without a license. He left the area shortly after his arrest. In 1989, his attorney entered a plea of guilty to the charge, and Caplinger received a two-year suspended prison sentence and was fined $500, the maximum penalty allowed by North Carolina law . During the period in which Caplinger was being investigated, a North Carolina official informed me that Caplinger had more than 30 certificates on his office wall. One of them was a "Doctor of Medicine" degree from the British West Indies Medical College , a correspondence school Caplinger himself operated (or pretended to operate). During the late 1980s and early 1990s, Caplinger also sold "interest" in this school. While operating the Blue Ridge Medical Clinic, Caplinger acquired an associate named Laurence Perry , whose credentials included a "diploma" from the British West Indies School of Medicine. In 2002, Perry was convicted of involuntary manslaughter and practicing medicine without a license following the death of an eight-year-old diabetic child whose mother followed Perry's advice to stop administering insulin . Another individual sporting a medical degree from this "school" was Joel Robbins, who operates the Health & Wellness Clinic of Tulsa, Oklahoma. Robbins, a licensed chiropractor, also has a naturopathic "degree" from the Anglo-American Institute of Drugless Therapy, which is a diploma mill. In 1993, Caplinger was charged in Florida with two counts each of financial exploitation of the elderly, grand larceny, and practicing medicine without a license. The investigator's report indicates that in 1990, while working in Florida as a medical assistant, Caplinger persuaded two elderly women that he was a "world renowned doctor" with a clinic in Santo Domingo and could help their husbands, who had Alzheimer's disease. After the treatment failed to help, the women realized that they had been duped and complained to the authorities . The "Alias/Street Name" box on the arrest record has the entry "Gregory Frazier." A report from the Florida Department of Law Enforcement (FDLE) states that the case was settled with a guilty plea and a "no contest" plea to reduced charges of "theft to deprive." Caplinger was placed on nonreporting probation for one year and ordered to return the victims' money . In 1996, Caplinger was arrested in Broward County, Florida, on ten counts of racketeering (RICO) and grand theft . The charges related to a 1993 scheme that defrauded chiropractors of "tuition" paid to attend his "medical school" in the Dominican Republic. More than 120 individuals paid several thousand dollars each. In 1997, the charges were dismissed after Caplinger agreed to make partial restitution. According to a report in Dynamic Chiropractic, Caplinger pretended to operate two entities: the "British West Indies Medical School" and the "Universidad Federico Henriquez Y Carvajal," to which students would supposedly transfer after nine weeks of preparatory coursework . In 1999, an FBI agent and I testified at a detention hearing about why we did not think Caplinger should be trusted to be released on bail. On the following day, he surprised everyone by pleading guilty and was permitted to reside with his mother in Indiana until the time he was sentenced. The release terms included: (a) remaining in Indiana, (b) electronic monitoring of his whereabouts, (c) surrender of his passport, (d) a ban on providing any type of health-care service or soliciting of investors, and (e) a $100,000 performance bond (secured by his mother's house). In 2000, a judge permitted Caplinger to rescind his guilty plea, and later he permitted Caplinger to leave Indiana to help prepare his defense. In March, two counts of money laundering were added to Caplinger's indictment. Weekley and Kampetis pled guilty to all of the charges against them. In July 2000, after a six-day trial. a jury convicted Caplinger on all counts, During the trial, government witnesses made it crystal clear that Caplinger's claim to be a medical doctor was bogus . They also exhibited photographs of several buildings mentioned in Caplinger's documents. The address for the Sussex General Hospital was occupied by an answering service; the "Florida Degenerative Disease Center" address was that of a liquor store; and so on. Caplinger did not show up to hear the jury verdict but fled with his fiancée (Flabia Berroa) to the Dominican Republic. In July 2001, he was apprehended and returned to the United States for sentencing. In October, the judge gave him the maximum sentence permissible under federal sentencing guidelines. In March 2001, a federal Grand Jury for the Eastern District of Pennsylvania indicted Caplinger on 39 counts of wire fraud in connection with patients seen at his Dominican clinic . In 2002, he pleaded guilty to one count and was sentenced to 5 years in prison, 3 of which would run consecutively and 2 of which would follow his previous sentence. He was also fined and ordered to make restitution of $484,545. In July 2001,Weekley was sentenced to 15 months in prison, to be followed by three years supervised release, Kampetis was sentenced to 5 years probation, and the pair were ordered to pay restitution of $4,365,082. While in prison, Caplinger appealed his sentence and got it reduced by about three years . His projected prison release date became July 28, 2012. However, he died in 2009 while still in prison. GREGORY E. CAPLINGER, M.D., PhD., N.D.
Dr. Caplinger is a well known physician, researcher and speaker throughout the world. Currently he is director of research at Blue Ridge Oncology Research Center, where the main areas of research are directed towards an immunological approach for the treatment of cancer. Dr, Caplinger serves as chief consultant in Nutritional Immuno-Oncology for World International Hospital Consulting Group, West coast oncology Consultants, and American International Hospital in Zion, Illinois. He has published extensively in the Journal of Cell Biology, Journal of Molecular Biology, and Journal of Developmental Biology. He is currently completing a textbook in the area of Clinical Endocrinology and Laboratory Data for the practicing holistic Physician. Recently Dr. Caplinger was presented with the coveted Caribbean International Prize in Medicine for his research in the area of cancer and immunology. He was also named as Doctor of the Year (1987) by the American Nutritional Medical Association. The American Nutrimedical Association (AMNA), mentioned in the above brochure, was a paper mill that issued dozens of different spurious credentials, including "professional membership" certificates to anyone who sent $50, and a Doctor of Nutritional Medicine (NMD) "degree" to anyone who claimed to have another doctoral degree and sent $250. AMNA's 1987 directories listed Caplinger's credentials as "NMD, MD, MDE, FACN, FANMA" and included Nutri-West among its affiliates. Other AMNA literature indicates that MDE stood for "Doctor of Eclectic Medicine," FACN stood for "Fellow of the American College of Naturopathy," and FANMA stood for "Fellow of the American Nutritional Medical Association." Despite what the brochure says, I could find no information supporting the claim that Caplinger was "a well-known physician, researcher and speaker throughout the world." On several occasions, I searched the MEDLINE, AIDSLINE, and CANCERLIT databases for "Caplinger G" and found no record of any scientific publication under that name. I have enclosed a copy of Dr. Caplinger's diploma for the degree of Doctor of Medicine awarded by Universidad Autonoma de Santo Domingo. This University was the first University in the new world and was chartered on October 28, 1538. It is recognized and accredited by the U.N. World Health Organization. Dr. Caplinger's former degree was re-certified. In addition, as proven by the enclosed exhibits, Dr. Caplinger was required, as a condition to receiving the degree from this institution, to take written, oral, and practical examinations in OB/GYN, Pediatrics, Surgery, and Internal Medicine . A photocopy of a "Doctor en Medicina" certificate from Universidad Autonoma de Santo Domingo, dated July 8, 1997, and apparently based on the doctor of Caplinger's medical diploma issued by the British West Indies Medical College. A partially indistinct copy of a document listing credits for 11 semesters of coursework and a rotating internship. The document, dated August 7, 1996, indicates an entrance date of October 10, 1995. A transcript listing four courses in taken in 1995/1996: institutional orientation, history of the Dominican Republic, basic Spanish, and surgery. Various other documents, which Krasnove describes as "an unrestricted Medical License in the Dominican Republic, as well as the Presidential Decree granting Dr. Caplinger and other applicants medical licenses." The documents appear to indicate that Caplinger registered his "Doctor of Medicine" title in 1997, but they contain no information about what this means. Krasnove also stated that the original 1993 charges in Florida were either "nolle prossed" (not prosecuted) or dismissed; that Caplinger did not admit guilt; that he pleaded only "no contest" to a misdemeanor charge of "petit larceny"; and that Caplinger received a "withhold adjudication of guilt, which means that he had not been convicted." To document his description of what happened, Krasnove enclosed a partially indistinct 1-page "court status report" indicating that Caplinger "pled nolo" to two charges (rather than one as stated in the document FDLE had issued in response to my request). Krasnove further indicated that he would ask FDLE to verify that Caplinger did not plead guilty to any charge in 1993. However, he sent me no additional documents. Did Caplinger ever physically attend classes at a medical school? If so, please provide the name and address of the school and the dates attended. Did Caplinger obtain an "MD" degree or diploma from the Metropolitan Collegiate Institute (UK)? If so, where is this school located, when did he attend, and exactly what did he do to obtain his degree or diploma? Please also provide a copy of the credential. Did Caplinger obtain an "MD" credential from the British West Indies School of Medicine or British West Indies Medical College, as was reported in Dr. Davant's article in 1988? If so, please provide the address of the school, the dates attended, and a copy of the certificate. In what specialty is Caplinger "Board Certified" by the British College of Physicians and Surgeons? Please identify the specialty and provide the name and address of the certifying organization and a copy of the credential. Did Caplinger undergo specialty training in internal medicine, oncology, immunology, or any other medical specialty? If so, Please provide the name and address of the institution and the dates during which this training took place. Did Caplinger receive an ScD degree from the Sussex Institute of Technology? If so, please describe the basis on which this was awarded, including the dates during which he attended any classes relevant to this credential. Caplinger's biographical sketch refers to a Sussex General Hospital. Please provide the address of this hospital. Caplinger's biographical sketch states that he is a professor at Utesa Medical School. Please specify what he teaches and provide the address of the school and the name and address of a school official who can verify that Caplinger is on its faculty. When did Caplinger begin representing that he had an "M.D." degree? Has Caplinger ever been licensed as a health professional in the United States? If so, please specify the nature of the license and who issued it, and provide a copy of any pertinent documents. Did Caplinger have a valid license to practice medicine in the Dominican Republic before 1997? If so, please specify where he was licensed and provide documentation. If not, please explain the legal basis under which he could treat patients in that country prior to 1997. During what years has Caplinger treated patients within ImmuStim? During these years, where was he physically located and where did the treatment take place? I would like to have a clear idea how Caplinger has spent the past 20 years. Please provide a curriculum vitae or other document listing his professional education and activities and including: (a) the dates on which each entry began and ended, and (b) clear indication of where Caplinger was living during each time period. I am particularly interested in knowing what years he lived in the United Kingdom, the United States, and the Dominican Republic. Following a complaint filed with the Florida Bar in 1982, he received a private reprimand for neglect . In 1986, he was publicly reprimanded and paid a fine. In 1999, after the Bar Association received yet another complaint, it concluded that there was probable cause to believe it was justified and referred the case to the Florida Supreme Court, which upheld it. To get reinstated from the 1997 and 1998 suspensions, Krasnove was required to comply with the terms of his suspension, "reveal of sense of repentence," and provide "evidence of unimpeachable character and moral standing in the community." In January 2000, a Supreme Court referee denied Krasnove's petition for reinstatement because he had: (a) failed to make appropriate restitution, (b) failed to give timely notice to a client that he was about to be suspended, (c) failed to give timely notice to another client that he has been suspended, (d) issued a former client a refund check that bounced, (e) compromised a former client's case by failing to return certain documents on time, and (f) failed to return about $3,000 to insurance companies he had represented that were entitled to certain refunds . The referee also assessed costs of $2,509.30. In 2001, after investigating additional complaints, the Bar Association recommended that Krasnove be disbarred and, in October 2002, the Supreme Court of Florida disbarred him for a period of at least five years . In 2004, he was disbarred in New York State . In 1984, Caplinger received a "Doctor of Naturopathic Medicine" degree from the Anglo American Institute of Drugless Therapy. This "school" was run by mail from a private residence in Renfrew, England. In 1990, the school's "dean," John Carson Dunlop, told a British police investigator that since 1977 he had had about 600 students and that Caplinger—whom he had never met—had earned his degree by completing lessons and submitting an 8,000-word thesis. Dunlop also said in 1988 that he had issued a "diploma in osteopathy" to Caplinger in 1988, based on a 19-lesson course and another thesis . 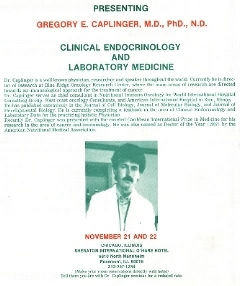 A 1984 educational program brochure stated that Caplinger was then practicing as a homeopathic physician in the United States and doing postgraduate studies in internal medicine through Harvard University; had just been board-certified in homeopathic internal medicine by the Hahnemann Medical Society; was directing a research project in ovarian metabolism at Ball State University; was founder and president of the Institute of Holistic Medical Research; and was a member of many homeopathic and preventive medical societies and a fellow in many of them. During the early 1990s, his simultaneously-held positions included director of research for Immunopharmaceuticals in the Dominican Republic; minister of Health of the British West Indies Health Confederation, an unspecified position at the Florida Degenerative Disease Center; chairman of the department of clinical oncology and immunology at Sussex General Hospital in England; professor of medicine at a Dominican Republic medical school; director of clinical research at the International Center of Oncology Research in England; dean of the British West Indies Medical College in Turks and Caicos Islands; and director of research at the International Oncology Research Center in California . Caplinger is listed, beginning in 1993, as senior vice president in charge of credential services for the American Nutrimedical Association. This organization, founded in 1983, issued the largest variety of bogus "board-certification" certificates and other health-related credentials I have ever seen—all obtainable by filling out a simple application and paying a fee . Caplinger's curriculum vitae lists several such credentials. The documents I have collected contain many claims about Caplinger's success. His "textbook" provides data on 18 patients divided into six groups of three, of which half received only Caplinger's "immunotherapy" (using various protocols), and half received his treatment plus standard surgery and chemotherapy (elsewhere). The summary table covers the patient's age, type and stage of cancer, diagnosis date, immunotherapy starting date, and "current status." The patients who underwent standard therapy all had breast cancer, but those who did not included six patients with other tumors. (In other words, the groups were not comparable.) Dates are missing from 3 patients in the table's "diagnosis date" column, 2 in the "immunotherapy started" column, and 11 in the "current status" column. The treatment dates ranged from July 1986 to February 1987, and the follow-up entries ranged from October 1986 to December 1987, during which time six patients died. (During this period, Caplinger was practicing in North Carolina. The report does not indicate where the patients were treated.) Of patients described as "currently living"—either cancer-free or with "stabilized" tumors, only one had a follow-up date specified—so that it is impossible to tell when Caplinger concluded whether or not they had been helped. Nevertheless, he concluded that some of the data "tended to indicate" that one of his protocols "enhanced" standard treatment and "will indeed give our patients a much greater chance for survival or at least improve their quality of life." Science-based reports on treatment outcome ordinarily provide 5-year follow-up data. Even though this report appears in a 1997 book, it does not appear that any of the patients were followed for longer than ten months. During my entire medical career, I have never seen a more pathetic-looking report. The report Caplinger distributed in 1996 (to prospective investors in his company) included one-line summaries of average results for 26 groups of patients—each group representing a tumor type—totaling 125 patients "randomly selected" from 1,275 patients he claimed to have treated. In discussing these results, Caplinger states that 128 patients were treated, 76 were in remission, 101 were living and in remission, and 27 were deceased. He does not explain why there were three more patients in his summary than in his table or how the number of patients "living and in remission could be greater than the total number of patients "in remission." Although the table has columns for tumor stage (severity), treatment type, and post-treatment status, the grouping makes it impossible to judge either the severity of the disease or the treatment received by individual patients. Caplinger also states that his 1,275 patients had an 81.8% survival rate, compared to a 31.16% 5-year average survival rate reported by the American Cancer Society. To develop useful statistics, it is necessary to collect data systematically and to be sure that any comparisons are made on comparable patients. Caplinger said nothing about how the patients were diagnosed, how the staging was done, who did the staging, or how he collected his alleged follow-up data. The reports were preceded by a disclaimer that, "This information is anecdotal and written in lay terms for the benefit of interested persons. Therefore, it is not a scientific publication nor a study with an objective to prove the existing protocol." Caplinger's 1998 "Advances" booklet stated that, during the previous five years, his "various centers and associates" had used his protocols to treat more than 22,000 patients with multiple sclerosis, ALS (amyotropic lateral sclerosis), severe allergies, rheumatoid arthritis, psoriasis, chronic sinusitis, fibrocystic breast disease, Epstein-Barr Virus, autoimmune disease, hypothyroidism, lupus, diabetes, chronic candidiasis, severe vitamin deficiencies, asthma, and "various metabolic imbalances," in addition to "thousands" of cancer and HIV/AIDS patients . The idea that Caplinger had "other centers" was contradicted by a disclaimer that "all information and treatment originated in and from The Dominican Republic." The booklet also claimed that Caplinger's "ultramodern cutting-edge immunology laboratory" enabled him to "detect physical problems before they reach the disease-state." The "Advances" booklet discussed 100 patients selected randomly from over 1,500 patients who were screened and evaluated for cancer. However, the table contained data for only 50 plus a statement that the results on the remaining 50 were similar. This time, the longest follow-up period was 36 months. Twelve patients with summaries in the table were said to be "cancer-free" after periods ranging from 8 to 32 months. However, a table summarizing the results of all 100 patients said that 60 who received Caplinger's treatment were cancer-free after an average of 36 months (although 7 of these were also reported as deceased after an average of 7 months). In yet another table, Caplinger claimed that his data showed that patients who received ImmuStim plus chemotherapy had a 40.3% better response than patients receiving chemotherapy. He also claimed that his 5-year survival rate was 86%, compared to the standard treatment rate of 35%. (Of course, he provided no actual data or description of how any follow-up data were collected.) He also claimed that 100% percent of patients reported "a marked improvement in their quality of life." Even if Caplinger's reports had been designed so that the data could be meaningfully interpreted, there's no reason to believe that the numbers were any more trustworthy than his credentials. Bill of indictment. United States of America v. Charles David Weekley, Harry J. Kampetis, and Gregory E. Caplinger. United States Court for the Western District of North Carolina, Statesville Division, July 12, 1999. Caplinger GE. Letter to prospective investor. July 30, 1996.
International Institute of Medical Science Hospital and Clinics. Undated brochure distributed in 1999. General information, International Institute of Medical Science Hospital and Clinics, undated, distributed in 1999. Wayne N. Undated letter distributed in 1999. Caplinger GE. Advances: Immu Stim-CAP Immunological Protocol. Santo Domingo, Dominican Republic: International Institute of Medical Science, 1998.
International Who's Who of Contemporary Achievement. Raleigh, NC: American Biographical Institute, 1996. American Medical Directory: Physicians in the United States, 30th Edition. Chicago: American Medical Association, 1986. Bear JB. Bear's Guide to Non-Traditional College Degrees, 9th edition. Berkeley, CA: Ten Speed Press, 1985. Davant C III. Health fraud—What's going on in North Carolina? North Carolina Medical Journal 50:341-346, 1989. Medi-Net search, June 20, 1999. Jarvis WT. Telephone conversation with British Embassy official, 1981. Bear JB, Bear MP. Bear's Guide to Earning Degrees Nontraditionally, 13th edition. Berkeley, CA: Ten Speed Press, 1999. Sussex Police Department. Letter with attachments sent to the U.S. Justice Department, National Central Bureau - INTERPOL, Oct 18, 1990. Caplinger GE. Progressive Immunology. London, England: British Medical Publications, 1997. Davant C III. No medical degree, no license? Come practice here. Medical Economics, Dec 18, 1989, pp. 70-85. Zimmerman D. CV discloses a deadly phony. Probe 8(2):4-5, 2000. Meyers P, investigating officer, Florida Department of Law Enforcement. Affidavit, March 4, 1991. Broward County Sheriff's Office. Short arrest information form, April 23, 1993. Florida Department of Law Enforcement. Florida criminal history report on Gregory Caplinger, issued May 25, 1999, in response to my inquiry. Complaint affidavit. Broward County Sheriff's Office, July 31, 1995. Kelly S. DCs lured to foreign medical school. Dubious goings-on down Santo Domingo Way. Dynamic Chiropractic Archives, Jan 1, 1993. Indictment. United States of America v. Gregory E. Caplinger. United States District Court for The Eastern District of Pennsylvania. Filed March 29, 2001. Trial transcript, USA v Gregory E. Caplinger, July 17-25, 2000. Volume 1, Volume 2, Volume 3. Krasnove KM. Letter to Stephen Barrett, M.D., June 8, 1999. Oftedal RL. Report of referee. In re: Petition for reinstatement of Keith Martin Krasnove, practitioner. Florida Supreme Court Case No. 95,475, Florida Bar Case No. 99-51,604(17G)-FIRE, January 31, 2000. Florida Supreme Court. Discipline Release, Oct 27, 1997. Florida Supreme Court. Discipline Release, Nov 23, 1998. Florida Supreme Court. Order. The Florida Bar vs. Keith Martin Krasnove, October 22, 2002. Matter of Keith M. Krasnove. 2004 NY Slip Op 04342 [7 AD3d 111] June 1, 2004. Caplinger GE. Curriculum Vitae of Gregory E. Caplinger, M.D., Sc.D. Undated, but probably published in 1994 or 1995. Strathclyde Police Department. Letter with attachments sent to Scotland Yard on Dec 28, 1990. Physicians Manual. Santo Domingo, Dominican Republic: International Institute of Medical Science Hospital and Clinics. Undated, contains entries dated as late as October 1996. Barrett S. American Nutrimedical Association. Quackwatch, 1999. This article was revised on February 7, 2019.